Dr. Binh Ngo and Dr. Del Shofner understand and appreciate a person's desire for a gorgeous smile. Healthy teeth and gums are always the top priority of dentists. And while visits to your dentist for scheduled preventive care are still essential, you will find a fun and exciting twist to Restorative Dentistry...the look and feel of Cosmetic Dentistry. So, why hide your smile when you can light up a room? Please take a few minutes and browse through our website. We think we can help you achieve your most radiant feature...Your Smile. 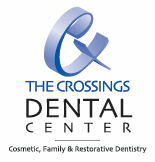 The Crossings Dental Center is constantly updating their skills to provide you with the most beaming smile. Find out more! The highest compliment our patient can give is the referral of their friends and family...To learn more about our patient referral program, please contact our office. Click here to learn more about Dr. Ngo and Dr. Shofner!